Photo: Children gather at one of our tutorial sessions helping to improve child literacy rates among the impoverished slum colony of Payatas. Today we bring you an update from our Children’s Hope Center after-school care program in the Payatas Landfill Colony of Manila, Philippines. We currently have 60 children enrolled who are studying math, English, their native Filipino language, science, social studies, technology, and skill development in grades 1-6, and algebra, geometry, English, the Filipino language, biology, chemistry, physics, social studies, technology, and skill development in junior high. All of the children receive homework tutoring for these subjects from our 12 faithful volunteers at the Hope Center every Saturday from 8:00-10:00 am for children 4-6 years old, 10:00 am-noon for children 7-10 years old, 1:00-3:00 pm for children 11-17 years old, and on Sundays in a morning and afternoon session. We also provide nutrition support for the children by giving them snacks and a fresh-cooked meal — such as rice, soup prepared with beans and local nutritious vegetables, bread, and champorado (sweet chocolate rice porridge) — before going home for the day. Our enrollment quota has decreased since July when we had 100 students. This is due to the fact that the mountain of garbage in the Payatas Landfill Colony has been closed since the last week in July because of the possibility of landslides which would kill the people living below it. The government decided to close this slum area to avoid what happened back in 2000 when hundreds of Payatas residents were buried alive. The dumpsite was recently moved to a rural area far from the Payatas Colony. Many of the Payatas residents depend on scavenging for their livelihood, so during the first week of August, many families moved away to live near the new dumpsite, including some of the families of our children who are beneficiaries of the Hope Center. Thus, these children are unable to come to the Hope Center regularly at this time. We hope and pray that these children and their families can soon move back near the Hope Center where we can help them, but we are very thankful for the signs of progress in our literacy program amongst the 60 children who are currently enrolled. We are focusing on the problem of illiteracy amongst impoverished children because it is an important part of our weekly after-school care program which has proven so successful in our other Children’s Hope Centers. We are teaching them to read their native Filipino language first so that they can learn how to have everyday conversations, especially the younger children. We are also helping them to learn English as a secondary language by teaching them basic conversational English. Our Hope Center volunteers have noticed that the children are reading better than before, especially in the Filipino language. Some children in 5th grade and higher are gradually learning to read well in English, and learning to construct sentences that they found difficult beforehand. Photo inset: (Top-left): The literacy program at our Manila Hope Center helps local at-risk children with their reading skills. (Top-right): Children at our Manila Hope Center receive homework tutoring for their school subjects, including math, English, and science. 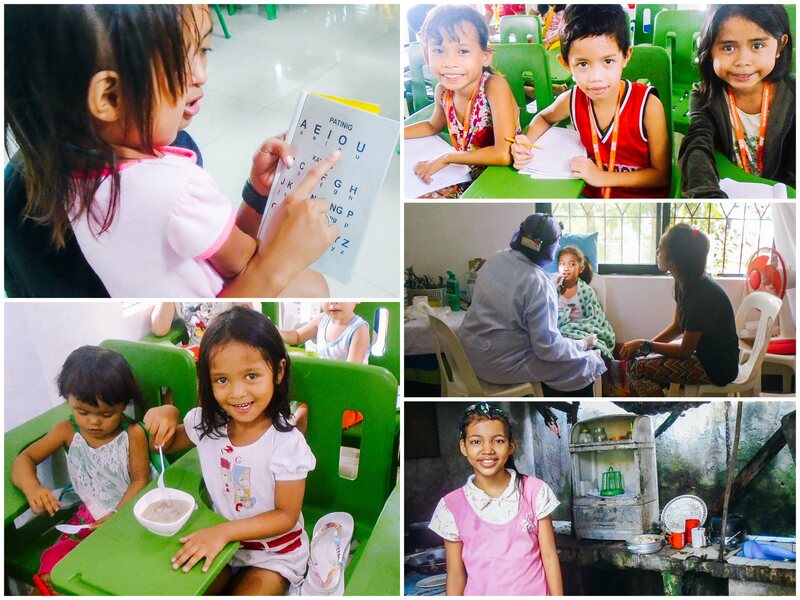 (Center-right): Our Manila Hope Center recently sponsored a dental and medical mission for both parents and children. (Bottom-right): ‘Yang-Yang’ has suffered many hardships; she is thankful for the educational and nutritional help given to her at our Hope Center. (Bottom-left): Our Manila Hope Center serves snacks (such as “champorado,” a sweet chocolate rice porridge, pictured here) and a fresh-cooked meal to children before they return home for the day. Jessie, a 10-year-old and 3rd child, had to stop his schooling because he is always absent from needing to help his parents with work, and his parents cannot provide him basic necessities to stay enrolled in school because of their poverty. He is supposed to be in 5th grade, but had to drop out at 4th grade. Justine, a 12-year-old only able to reach 5th grade. She is the first child of the family, so she’s helping her parents and 4 siblings to raise needs day by day through scavenging. 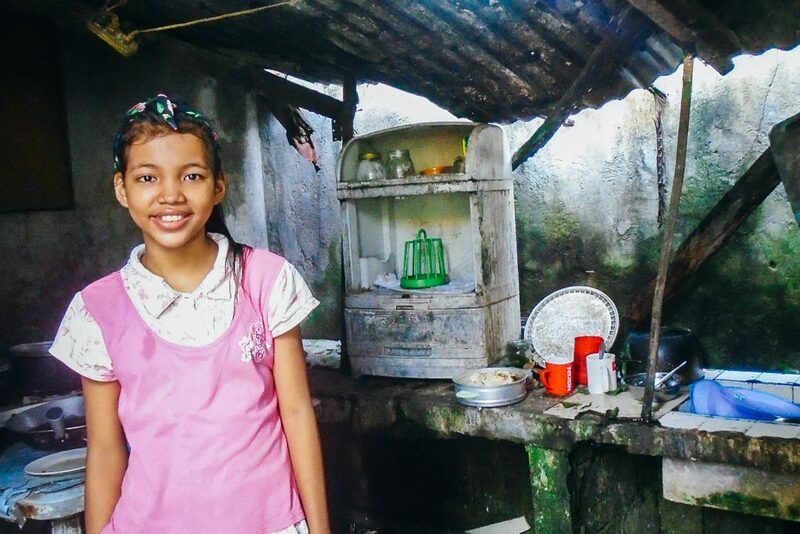 Angelica is 17 and just dropped out of school during her senior year because of lack of money for providing her tuition fees and a dire need in her family to help them with their financial needs. She is the oldest of 3 girls. She comes from a broken family and her father has no stable job. In spite of her own hardships, Angelica has started volunteering with our team to care for the other children at the center. Nika, Angelica’s cousin, likewise could not continue her studies and dropped out of school at grade 10 for similar reasons. Bernadeth just stopped her studies in 10th grade last month because of her parents’ critical financial situation. She had to drop out of school to begin work at a fast food shop but she still makes time to volunteer every Saturday at the Hope Center when she has her day off. Lastly, Jaypee, age 15, is also no longer in school because of his family’s critical financial situation. His parents can’t provide their needs for school because of life difficulties and they need him to help out with wage earning to support the family. She comes from a family with 7 children, and her dad is a taxi cab driver who earns $20 a day. Yang-Yang, her father, and brothers are mourning their mother who died 3 years ago. Since Yang-Yang is the 3rd child and the only sister, she is the one who cares for her 3 younger siblings — she is like a little mother to the family. She can cook, budget the money for the food and school allowances, and she washes the family’s clothes and does the other household chores — all of this at such a young age. Yang-Yang’s oldest brother is only 15, her second brother is 14, her 3rd little brother is 10, her 4th little brother is 6, and the youngest is only 3 years old. All of them are active members of our Children’s Hope Center program. Yang-Yang’s favorite foods are the vegetable dishes — she always enjoys the food being served in our nutrition program. Her favorite subject is math — she says she feels excited during the math lessons, and she excels in our math tutorials. She also helps guide and teach mathematics to the 5- to 8-year-olds in our program.​ She has improved in reading and writing in English as well. Although she has difficulties in her studies because of her impoverished living situation filled with hardships, we can see her dedication and determination in life. 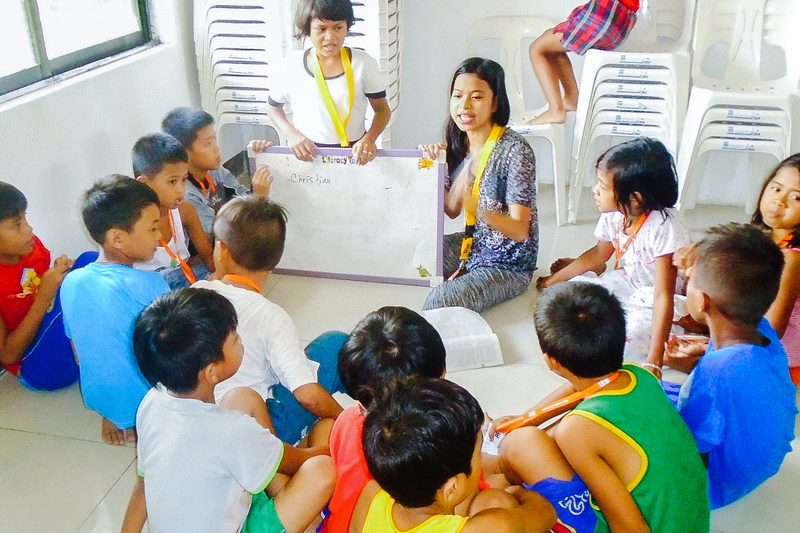 She is grateful to attend the Payatas Children’s Hope Center because it helps she and her siblings so much, and they also have the opportunity for spiritual guidance and encouragement through our children’s Bible study on Sundays. This is another way the Hope Center creates and molds children with values to help them grow up to be upstanding and successful adults in their community. We are also happy to report that the Hope Center sponsored a dental and medical mission in August. Our field director’s friends — 2 dentists, 2 opthamologists, and 3 assistants — offered their services for free to 30 parents of our Payatas children and 10 children. All 40 of these patients needed tooth extractions which the team provided free of charge. They also checked everyone’s vision, and thanks to your support and generous donations, we were able to distribute reading glasses to 20 patients and also gave out vitamins and medicine for fever and colds. We are ever grateful for your prayers and faithful support which makes all that we do for these children possible.